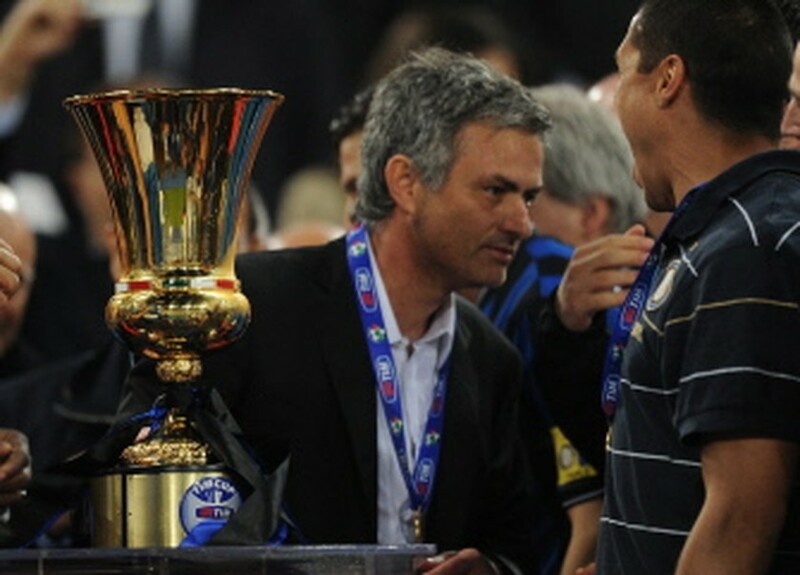 ROME, May 6, 2010 (AFP) - Inter Milan coach Jose Mourinho landed his second major trophy with the Italians and then immediately declared his desire to return to England. The former Chelsea boss has been a huge success in Italy, winning the Serie A title in his first season with Inter and guiding them to their first Champions League final in 38 years in his second. On Wednesday night he added the Italian Cup to his resume as Inter beat AS Roma 1-0 thanks to a Diego Milito goal in the Stadio Olimpico in Rome. But afterwards, the Portuguese boss's thoughts turned to the Premier League, where he was also a great success, winning two titles the FA Cup and two League Cups in three seasons. "I still miss the Premier League, I still miss even living in England as I did for three years and I know I will return for sure, no doubt," he said. "When, I don't know, no-one knows. It depends on many things. Will it be next season? "For sure I don't think so. I could go to any club but I don't think it will be next season. I can coach other teams, not just Chelsea. "Chelsea is a beautiful past but I'm not a Chelsea coach, I'm a coach and I can coach other teams." Mourinho's words will have done nothing to dampen the rumours that he is headed for the exit door at the end of this campaign. In the pre-match press conference he had refused to commit to Inter next season while in the past he has said that he doesn't like Italy or Italian football. And in Spain the press speculation is that he will join Real Madrid. But before he does leave, Mourinho wants to be the first Inter Milan coach since Helenio Herrera to win Europe's premier club competition, while there is also the matter of securing another title. Inter play Chievo at home on Sunday, Siena away next weekend and then Bayern Munich in the Champions League final on May 22 in Madrid. "We have two more matches in the league and they're crucial. That's different from Bayern because they are already champions (all but mathematically) and can relax and go to Berlin to play Hertha in a much more relaxed way. "We have two league matches left and if we make one mistake we could lose the championship. "We cannot relax, tomorrow (Thursday) we have to start again, thinking about Chievo and Siena and after that we have four or five days to think of Madrid." Turning his attentions to the fractious and bad-tempered Cup final, in which Francesco Totti was sent off late on for a wild kick at Inter's Mario Balotelli, Mourinho said it was no surprise the match wasn't a classic. "It's very difficult for a final to be a great spectacle, all throughout history finals have been like this," he said. "The final is a tense affair with two teams who are focussed, aggressive, closing down spaces, defending well, waiting to counter from a mistake. "What happened with Totti at the end can happen, I'm not judging. You can lose your head, it's not a problem, it can happen." Roma coach Claudio Ranieri accused Inter of gamesmanship and putting pressure on the referee. "We fell into their trap and we shouldn't have," he moaned. "We needed to play football but this match got to us and we were on edge. "In the first half hour we didn't even manage to string three passes together. "Milito did brilliantly to create a chance and exploit it. In the second half we played much better but unfortunately didn't manage to score from our chances. "Francesco made a mistake because in our league games against them we did well to not fall into their trap, but here we didn't do it because Francesco was sent off and we lost, so well done to them. "They're very good at that, they're very physical. When there's a foul all their players go to the referee and put pressure on him. "They always put the referee in a situation where he feels he has to be careful, but that's normal."